Happy Monday, everyone! It's Laura here from makingcardsisfun.com and it's been so long since I did a blog post for the Winnie & Walter blog. In today's video, I'm making a clean and simple card inspired by Debby Hughes. I'm using the Comfort + Joy stamp set along with the Merry & Bright with Evelin T Designs set to stamp a wreath and do some two tone heat embossing. Like I mentioned in the video, this design was inspired by the talented Debby Hughes. She makes such stunning cards and I especially love her watercolored creations and her super clean and simple cards. I decided to CASE her card for today's post with some Winnie & Walter goodies. First, I used a circle die to trace the shape of my wreath. Next, I started stamping some of the images from the Comfort + Joy stamp set. One thing to keep in mind is to erase the pencil line before stamping. You won't be able to erase the pencil mark after stamping on top of it with the ink. I mixed and matched some soft, pastel colors for this wreath. After finishing my little wreath, I decided to heat emboss a sentiment fromthe Merry & Bright with Evelin T Designs set. Since I couldn't really choose between two different embossing powders, I thought it'd be fun to combine these two colors together. I simply sprinkled on the Mermaid embossing powder on first, then removed some of it with a brush and finally I sprinkled the gold embossing powder on top. I love that effect! To finish off my card, I adhere some clear sequins here and there. That's it for now. A big shout out to Debby Hughes for inspiring me. :) Thanks so much for reading today's blog post. Happy stamping! This is such a beautiful card Laura. Thank you for sharing it! Love your card with the pastel wreath and beautifully embossed greeting. Your card is so pretty. Love the colors you chose. Love the pretty, soft, pastel colors on your card, Laura! Beautiful card, Laura. Your layout shows the beauty and elegance of these stamps. It is great to have you back. Cheers! 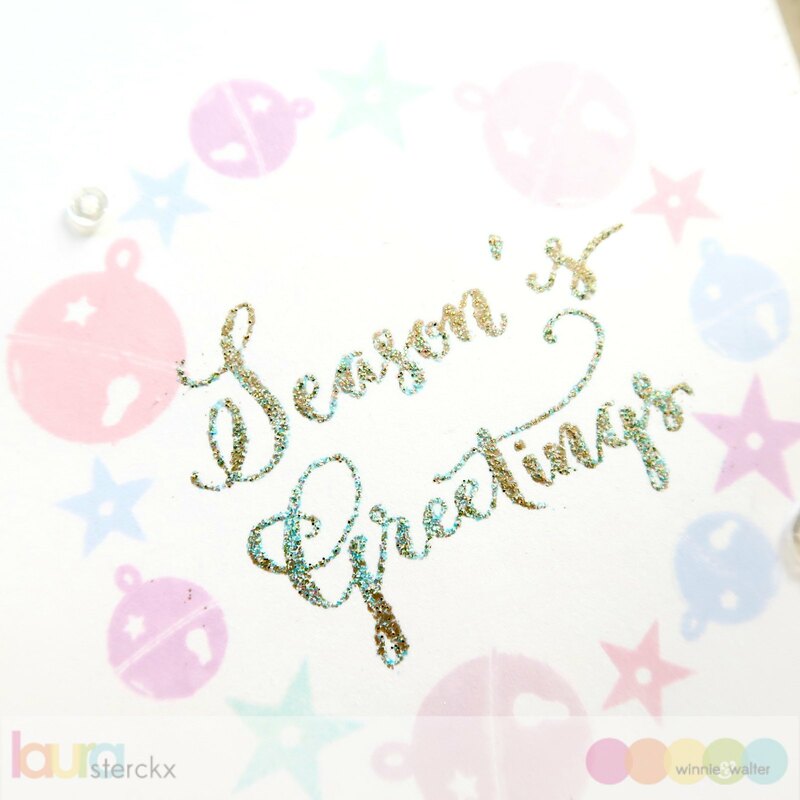 So pretty and soft Laura and love the idea of mixing embossing powders. Really must get my hands on some coloured ones so I can try this out!! I was surprised that when you brushed off the first color of embossing powder, that it did not take most of the embossing ink with it. Obviously you knew what you were doing, as it resulted in a beautiful sentiment to your card. Nice work. Just in time for the holidays, I'll just need to find the materials I need and I may mix and match something. I do some painting via acrylic and I want to incorporate this in my cards. Happy Holidays!